You know how Game 7s are. Sometimes they deliver a hard-fought battle to the bitter end, like the one we saw on Monday night in Washington's 2–1 win over the Islanders. And sometimes they spiral quickly out of control, eliminating all suspense in short order, like we saw last spring when the Rangers lit up the Capitals, 5–0 in the first round two years ago. In other words, who really knows how tonight’s final showdown between the Red Wings and the Lightning will play out? It could be another road win–the visitors have won four of the six games played so far. It could feature a goalie duel or a goalie meltdown. A team could be carried on the back of an unlikely hero—think Max Talbot for the Penguins in Game 7 of the 2009 Stanley Cup finals. Or it could be exactly the player you’d expect to step up, say Steven Stamkos or Pavel Datsyuk. Tampa Bay, the league’s highest-scoring team during the regular season (3.16 goals per game) hasn’t quite hit its stride in this series (2.50), but it has that breakout potential. Tyler Johnson has emerged as the Lightning’s offensive dynamo, scoring a team (and league) leading six goals. He’s set a franchise record with three multi-goal games in the series, all of which were won by the Bolts. Nikita Kucherov is coming off a three-assist performance in Game 6. Stamkos has been held without a goal in eight consecutive games, his longest drought of the season, but he’s been getting good lucks. Is this the night he finally breaks through? The Wings have had nine different goal scorers in this series, including three tallies by Datsyuk. The Magic Man is their potential gamebreaker. Henrik Zetterberg has yet to dent the twine, but he leads the team with 15 shots on net. The Bolts are allowing just 22.8 shots per game so far in the postseason. Only St. Louis (22.7) has been stingier. Detroit is giving up 30.5, ranking 10th in the league. The loss of No. 1 defenseman Niklas Kronwall (suspension) could hurt that stat, but maybe not as much as commonly thought. Kronwall has been a possession disaster in this series, registering a 39.37 Corsi rating according to War On Ice. His expected replacement for tonight, rookie Alexey Marchenko, is worse at 31.25 but has seen limited use so far. The Wings announced this afternoon that veteran Marek Zidlicky will also miss the game with an upper body injury. Jakub Kindl will dress in his place. Both bluelines have chipped in 10 points each during the series. This Game 7 will be the first for both Ben Bishop and Petr Mrazek, arguably the two most important players in this showdown. Both have three wins this series. Neither has won two straight. Bishop has the lower goals-against (2.18 to 2.29). Mrazek has the higher save percentage (.924 to .904), but Bishop has been more effective at even strength (.944 to .906). Mrazek has pitched two shutouts, both in the wake of losses. Going by the eye test, Bishop has appeared to be shakier. He’s struggled visibly with his technique, particularly his positioning and rebound control, and has been victimized by more questionable goals. Mrazek has been steadier with moments of true greatness, like that desperation stick save on Brian Boyle in Game 6. Mike Babcock has never won a Jack Adams Award but he’s probably in line for some sort of lifetime achievement recognition. He’s widely regarded as the best bench boss in the game, a man who has won championships with topflight talent (two Olympic gold medals, one Stanley Cup) and has coaxed lesser groups to exceed expectations. His teams are just 3-4 in NHL playoff Game 7s, but he’s been there before, which is more than can be said for Jon Cooper. This will be his first rodeo, although he has both a Clark Cup (USHL) and a Calder Cup (AHL) on his résumé. He also has the advantage of the last change by virtue of home ice and can get the matchups he wants. Amalie Arena jam-packed with rabid Lightning fans should provide an advantage to the team that posted the league’s best home record during the regular season, but the Wings already have won two games in this building. If they score early (teams that tally first in Game 7s are 116-41 all time; home clubs are 92-65), the crowd could become a non-factor. The Red Wings boast more Game 7 experience. Their players have skated in a combined 41 such games compared to 33 for the Lightning. Tampa Bay has the burning motivation to erase the sting of last season’s first-round sweep at the hands of the Canadiens. They also have a potential game-changer in Stamkos who seems unlikely to go an entire series without making an impact. If you're a betting man, go with the Lightning. • Tonight’s Red Wings-Lightning showdown will be the 35th Game 7 since the start of the 2009 postseason (a total of 98 series), making seven the most frequent series length during that span (7 games: 35; 6: 30; 5: 20; 4: 13). • A total of 39 of the 157 Game 7s in NHL history (25%) have gone into overtime with road teams winning 20 of them. • The team that has scored first has won eight of the past nine meetings between the Red Wings and Lightning during the regular season and playoffs. Playing in their first playoff series in nine years, the Maple Leafs looked like they had things sewn up with a 4-1 lead and 14 minutes remaining in the third period. That's when Boston found the magic. The Bruins scored three straight to close the third, with Patrice Bergeron hitting the tying goal as well as the winner six minutes into a tense overtime period. For the Maple Leafs, who came back from 3-1 down in the series to force a Game 7, it was perhaps the cruelest end to a playoff run that had the city of Toronto on its collective toes. The Devils wasted a 2-0 lead in the third period, then recovered as Adam Henrique scored his second goal of the game at 3:47 of the second overtime. Henrique picked up a loose puck in the right circle, skated toward the slot and beat Jose Theodore with a low shot. 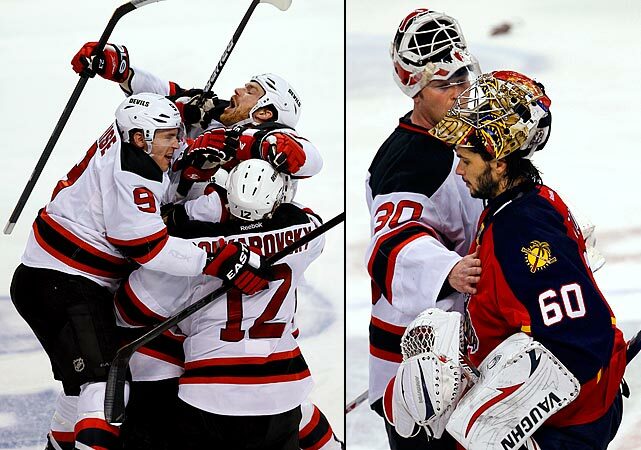 The Devils mobbed Henrique, as Theodore knelt on the ice in disbelief. Martin Brodeur made 43 saves for the Devils in a game that ended on April 27 -- the 20th anniversary of Brodeur's first playoff appearance for New Jersey. It was fitting that perhaps the closest playoff series in NHL history -- all seven games were decided by one goal -- ended in overtime. 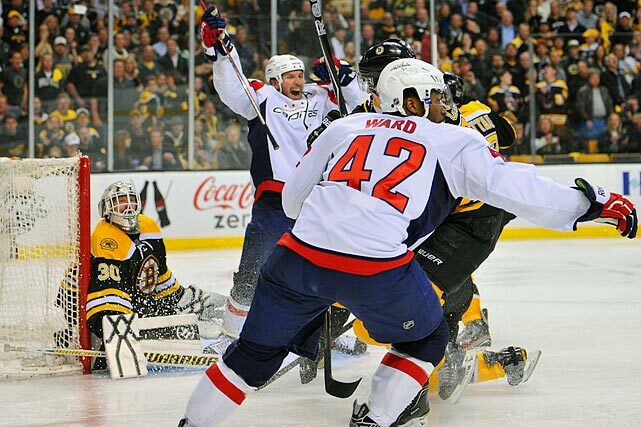 Matt Hendricks and Joel Ward, two forwards who combined for all of 10 goals in 151 regular-season games, were all the offense Washington needed as rookie goalie Braden Holtby came through in a thrilling 2-1 win at TD Garden that ended Boston's defense of the Stanley Cup. The winning goal came after Mike Knuble blocked Benoit Pouliot's dump-in to Washington's zone. Knuble raced down the ice, shot, and bumped into goaltender Tim Thomas as the rebound came out to Ward, who backhanded the puck into the net. It was a remarkable outcome given that few people thought the Capitals had much of a chance after their up-and-down season that saw coach Bruce Boudreau replaced by Dale Hunter in November. Eventual Conn Smythe Trophy-winner (as playoff MVP) Tim Thomas stopped all 24 shots he faced, Nathan Horton scored with 7:33 left in regulation, and the Bruins hung on to beat the upstart Lightning 1-0 and reach the Stanley Cup Final for the first time since 1990. For all the blame Patrick Marleau has shouldered for San Jose's postseason failures, it was only fitting that his winning goal helped the Sharks avoid one of their biggest collapses. Marleau got his first point of the series when he knocked home a rebound with 7:47 to play and then made the key defensive play in the closing seconds of an amazing Game 7 -- the sixth one-goal outcome in their series. San Jose advanced to its third conference final in franchise history; but of similar importance avoided becoming the fourth team in NHL history to blow a 3-0 series lead in the playoffs. Nathan Horton scored 5:43 into overtime with a slap shot off a pass from Milan Lucic, setting off a celebration on the Bruins' bench and in the stands. 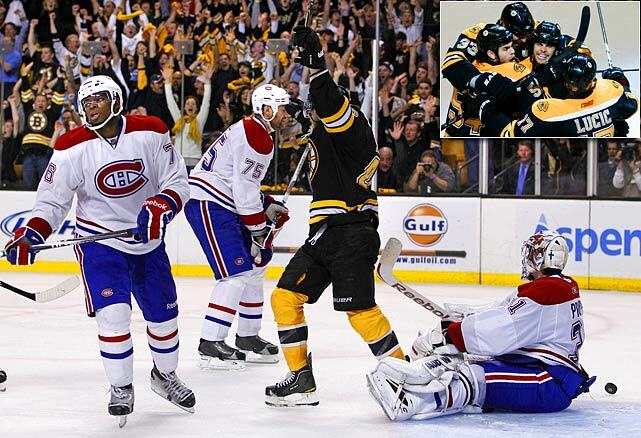 It was Boston's third OT win in the series, including Game 5 when Horton scored 9:03 into the second extra period. The Canadiens won the first two games in Boston to swipe home-ice advantage, but the Bruins came back to win three straight -- including the first two in Montreal, and then Game 5 at home. After being eliminated the previous two years by Chicago, Vancouver finally returned the favor. Alex Burrows scored his second goal 5:22 into overtime, Roberto Luongo made 31 saves, and the Canucks avoided an historic playoff collapse by knocking the defending Stanley Cup champions out in the first round. Burrows, who took a penalty early in OT, pounced on a Chris Campoli turnover and fired a slapper over the right shoulder of rookie goalie Corey Crawford. Burrows had opened the scoring 2:43 in, but Blackhawks captain Jonathan Toews scored his first goal of the playoffs shorthanded with 1:56 left, forcing OT. Vancouver had won the first three games before the Hawks roared back with three straight victories, threatening to spoil the Canucks' Presidents Trophy-winning season by becoming just the fourth team in NHL history to erase an 0-3 series deficit. Down 3-0 in games, Philadelphia rallied to tie the series. Down 3-0 in Game 7, Philadelphia rallied again and Simon Gagne's power-play goal in the third period lifted the Flyers to an improbable 4-3 win over the Bruins. It was a humiliating defeat for Boston, which became the third team in NHL history to flush a series after winning the first three games. 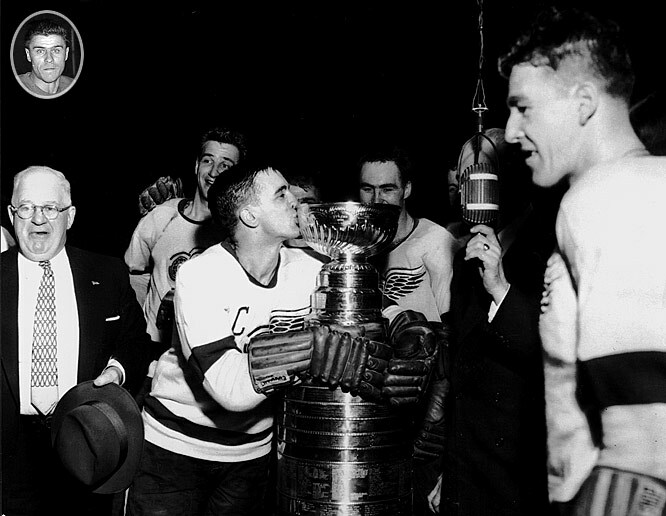 The Flyers thus joined the exclusive ranks of the 1942 Toronto Maple Leafs, who beat Detroit, and the 1975 New York Islanders, who eliminated Pittsburgh, by climbing out of an 0-3 coffin. The other 159 teams that had won the first three games of a series had prevailed. Up 3-2 on home ice with the great Martin Brodeur in net and less than two minutes left to play, the Devils were sitting pretty, or so it seemed. 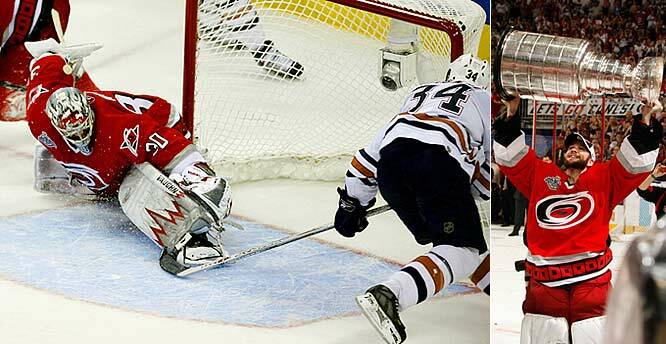 Then Jussi Jokinen (left) scored for the Hurricanes with 1:20 to go and Eric Staal (right) shocked New Jersey by beating Brodeur with 32 ticks to spare on the clock. "This is as sweet as it comes," said Carolina goaltender Cam Ward, who made 32 saves. "That's why you never give up and play until the final buzzer." The series was a war, with the Stars climbing out of a three-games-to-one hole. Three of the seven games were settled in an extra session -- including a four-OT thriller in Game 1, won by the Canucks, 5-4, with goalie Roberto Luongo (inset) making 72 saves in his postseason debut. 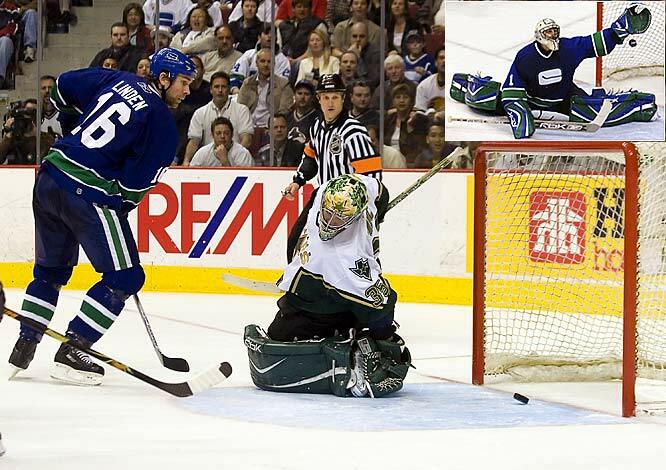 Vancouver advanced on home ice as its longtime hero Trevor Linden, a veteran of eight career Game 7s, broke a 1-1 tie by tipping a Mattias Ohlund shot past Stars goalie Marty Turco seven minutes into the third period. Bryan Smolinski and Taylor Pyatt later added empty-netters. Carolina's RBC Center was rocking as Cam Ward earned the Conn Smythe Trophy with a 22-save performance that held off the underdog Oilers' furious comeback from a three-games-to-one deficit. Aaron Ward, Frantisek Kaberle (power play) and Justin Williams (empty net) scored and Ward did the rest while becoming the first rookie goalie since Patrick Roy in 1986 to backstop his team to the Stanley Cup. Hurricanes captain Rod Brind'Amour was the hero, pouncing on a rebound and beating Buffalo's Ryan Miller to snap a 2-2 tie at 11:22 of the third period. Brind'Amour also assisted on Justin Williams' tally in the final minute to seal the win before a delirious home crowd. Rookie goaltender Cam Ward continued to make his case for the Conn Smythe Trophy as playoff MVP by making 22 saves. Clinging to a one-goal lead, Nikolai Khabibulin stopped Keith Primeau on a second-period breakaway and the Lightning hung on to win their first Game 7 and advance to their first Stanley Cup Final. Former Flyer Ruslan Fedotenko scored a deflected power-play goal at 16:46 of the first period and Frederik Modin netted the winner at 4:57 of the second. 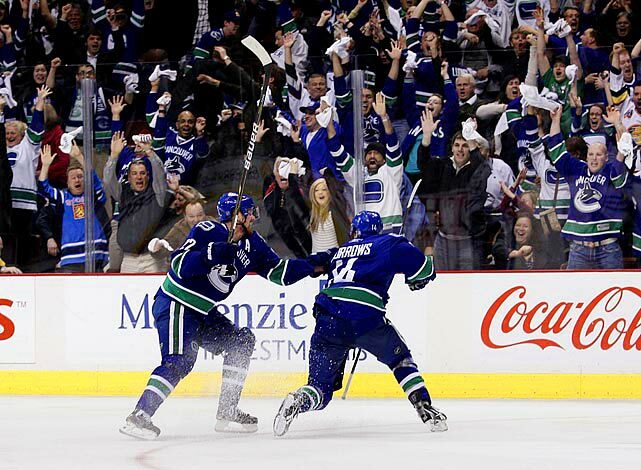 After blowing a 4-0 lead, the Canucks got a goal from Brendan Morrison in triple OT of Game 6 and returned home for their decisive match. It was a hair-raising see-saw. Down 2-1 in the final minute and on a power play with their goalie pulled, the Canucks took a cross-checking penalty and then watched as Calgary's Jarome Iginla, who had scored twice, narrowly missed an empty net. Incredibly, Matt Cooke jammed home the tying goal off the rebound of a shot by Markus Naslund with only 5.7 seconds left. But the crowd went home unhappy when Calgary's Martin Gelinas scored 1:25 into OT. The Canadiens came all the way back from a three-games-to-one deficit for the first time in their storied history, winning a defensive battle in Boston. The Northeast Division champion Bruins held the underdog Habs to one shot in the third period -- until Richard Zednik broke the scoreless tie with 9:08 left by knocking home the rebound of Alex Kovalev's shot. Zednik also scored into an empty net. The Lightning held the Flames to a measly seven shots in the first two periods, but had to withstand a wild final stanza to make Ruslan Fedotenko's two goals stand up. Bolts goalie Nikolai Khabibulin stopped 16 shots in the third period, including a dazzler on Jordan Leopold with the net wide open. The Flames got a power play tally from Craig Conroy midway through the third, but that was it. "We just tried to get through it, and we found a way," Lightning coach John Tortorella said. "It's unbelievable. It's a great feeling." After the Devils blew a three-games-to-one lead on the Presidents' Trophy-winners, winger Jeff Friesen had to redeem himself for a third-period turnover that allowed the Senators to tie the game at 2-2 in front of a roaring crowd in Ottawa. 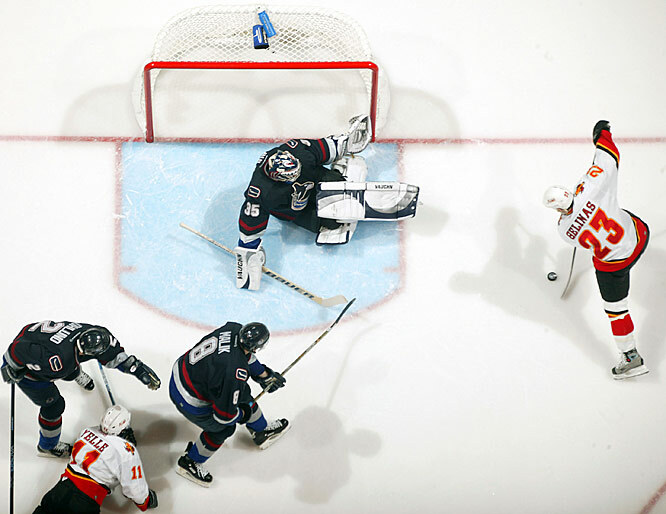 With 2:14 to play in regulation, Friesen scored the biggest goal of his career, beating goalie Patrick Lalime. "I couldn't even react, I couldn't even describe what that was like," Friesen said. "It just happened to work out that I got a chance to get that big goal." 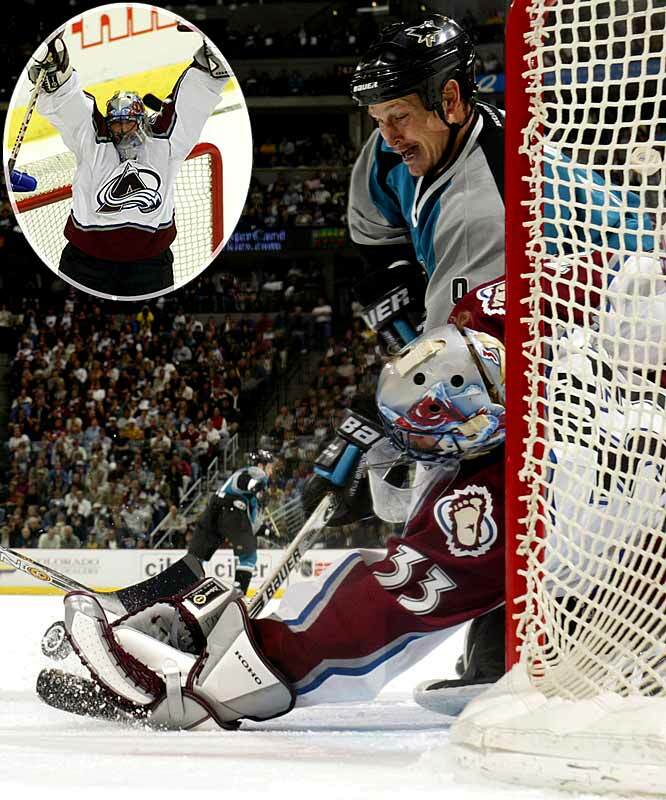 Patrick Roy was masterful in stopping 27 shots while the Avs nursed Peter Forsberg's second-period goal, especially during San Jose's two-man advantage in the final 55 seconds. Roy extended his NHL record with his 22nd career playoff shutout. "I said before Game 6, if there is one player I'm not worried about for Game 7, it's Patrick," said Colorado coach Bob Hartley. "He's our energy, he's the reason that every game we feel that we have a chance to win. He came up large tonight." Mario Lemieux's goal with 1 minute, 18 seconds left in Game 6 forced a decisive showdown against Dominik Hasek and the Sabres in Buffalo. "It's the most exciting thing in hockey," Hasek said. "We only have to win the game." Alas, Penguins blueliner Darius Kasparaitis prevented that by beating Hasek in OT for his first career playoff goal. After falling behind in the series, 3-1, the Devils slammed the door on the Flyers. 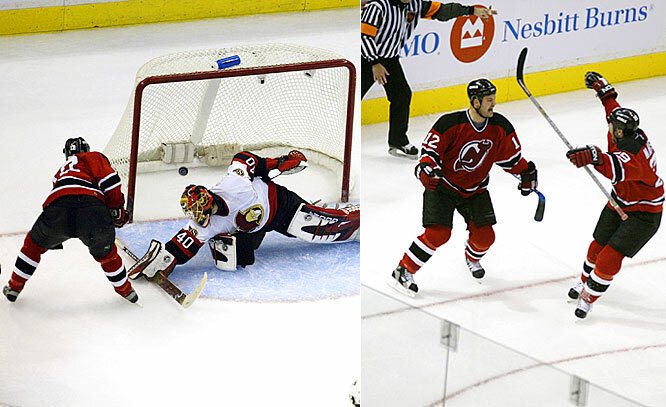 Martin Brodeur was brilliant as the Devils won both Game 6 and Game 7 by 2-1 scores. Game 7 was played in Philadelphia and Flyers fans will never forget the sight of Devils defenseman Scott Stevens drilling Eric Lindros (inset) as the Flyers captain crossed the blue line with his head down early in the first period. Patrik Elias scored the decisive goal for the Devils in the third period. 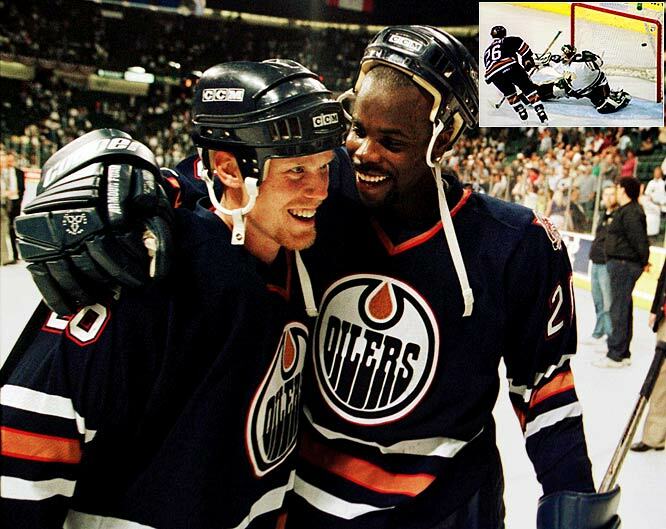 The Oilers pulled off a huge upset when, after a dazzling save by goalie Curtis Joseph, Doug Weight found winger Todd Marchant with a pass. Stars defenseman Grant Ledyard fell and Marchant went on on a breakaway, beating Andy Moog with a high shot at 12:26 of the third extra session. "It was one of those games where you knew something weird was going to happen. Toddy scoring would likely be it," Oilers coach Ron Low told the Edmonton Journal. "He'd only had about 500 breakaways that year and scored on one percent of them." 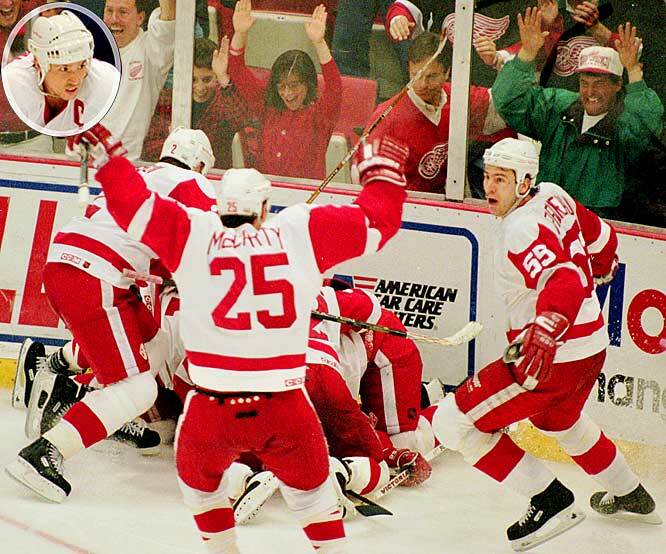 Red Wings captain Steve Yzerman (inset) ended an epic goaltending duel by grabbing a puck off Wayne Gretzky's stick, taking off and beating Jon Casey with a slap shot from the blue line at 1:15 of double overtime. "I couldn't believe it went in," Yzerman said after the game. "I don't score a whole lot of goals from out there. To score a goal in overtime, particularly in Game 7, is a tremendous thrill. Every player dreams of that." New York's 54-year quest to recapture Lord Stanley's old silver mug came to an electrifying conclusion in the deafening confines of Madison Square Garden. The Rangers saw their leads of 2-0 and 3-1 trimmed and had to hang on through a tight third period that ended when the Canucks couldn't convert off a face-off in New York's end in the final ticks. 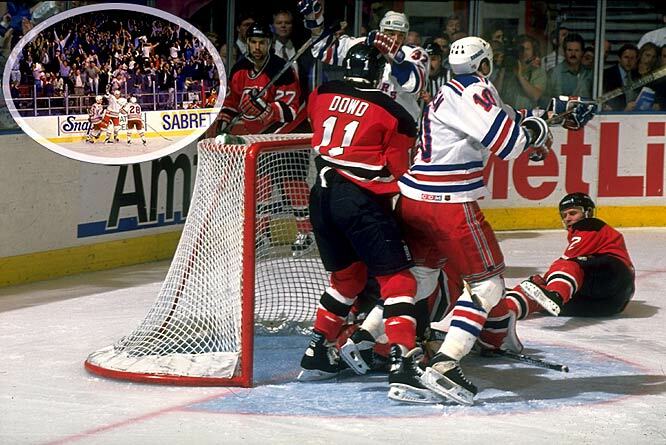 Mark Messier's famous guarantee of a Rangers victory in Game 6 set up this nail-biting defensive battle. New York led 1-0 until the Devils tied the game with only 7.7 seconds left in regulation at Madison Square Garden. The winner was scored on Devils goalie Martin Brodeur by Stephane Matteau (32) at 4:21 of the second extra session -- his second double-OT goal of the series. 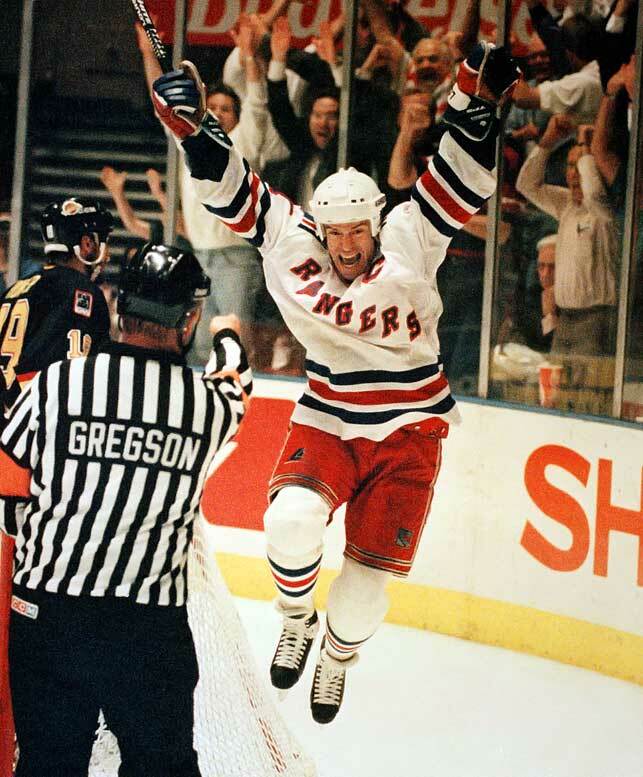 Rangers fans will never forget broadcaster Howie Rose's cries of "Matteau! Matteau!" The scrappy Isles dethroned the two-time defending Cup champion Penguins of Jaromir Jagr and Mario Lemieux as goaltender Glenn Healy (42 saves) weathered a first-period storm and hung tough after New York blew a 3-1 lead late in the third period. In OT, little-used winger David Volek was the unlikely hero, beating goalie Tom Barasso for his second tally of the game. Volek had scored only eight during the regular season. Known as the Easter Epic, the Isles and Caps battled in Washington through 69 minutes of extra play after New York's Bryan Trottier tied the game 2-2 with 5:22 left in regulation. At 1:57 a.m. -- nearly seven hours after the opening face-off -- Pat LaFontaine beat Caps goalie Bob Mason with the game-winner. Some players lost up to 15 pounds during the game and were reduced to taking 20-second mini-shifts. Isles goalie Kelly Hrudey made a whopping 73 saves. Steve Smith (5) probably still lies awake thinking about this one. The Oilers' bid for a third straight Stanley Cup was derailed when the young defenseman attempted a cross-ice pass from next to his own net early in the third period with the score tied 2-2. The puck hit Oilers goalie Grant Fuhr's leg and wound up in the net, giving Calgary the lead. Smith fell to the ice and buried his face in his gloves. Don Cherry probably still lies awake thinking about this one. His Bruins had a 4-3 lead against the three-time defending Stanley Cup champions with four minutes left, but got caught with too many on the ice. 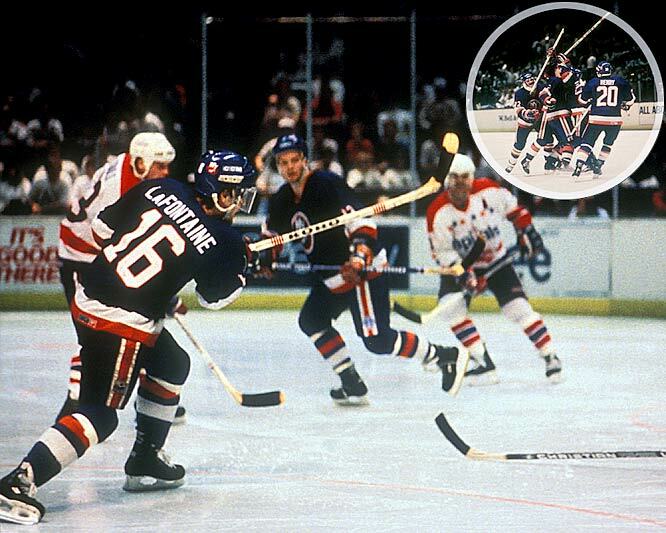 Guy Lafleur's subsequent power-play goal tied the game with 74 seconds to go. Yvon Lambert delivered the crushing blow with a goal at 9:33 of OT (inset). Montreal's rookie goalie Ken Dryden began cementing his legend by holding off the Blackhawks in Chicago long enough for his team to rally from a 2-0 hole late in the second period. 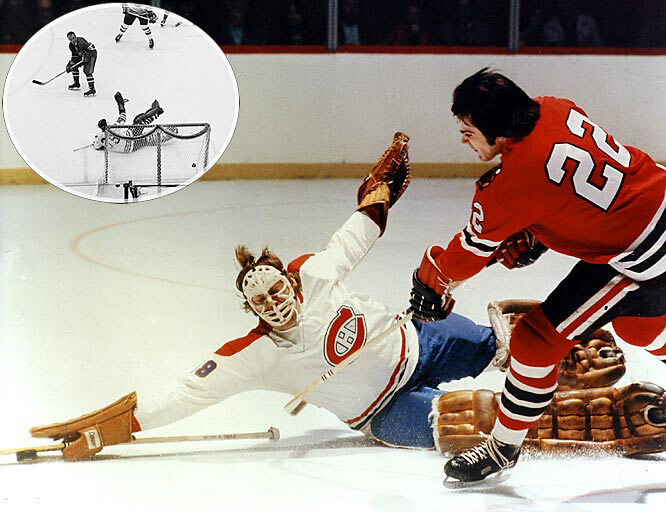 Henri Richard scored the tying and decisive goals against Chicago's Hall of Fame netminder Tony Esposito (inset). Diminutive winger Tony "Mighty Mouse" Leswick (inset) ended a defensive struggle with a goal at 4:29 of OT to give Detroit the Cup. Goalies Terry Sawchuk (Detroit) and Gerry McNeil (Montreal) seemed locked in until Leswick floated a shot that glanced off Canadiens defenseman Doug Harvey's glove and into the net. The match remains the last Game 7 to decide the championship in OT. 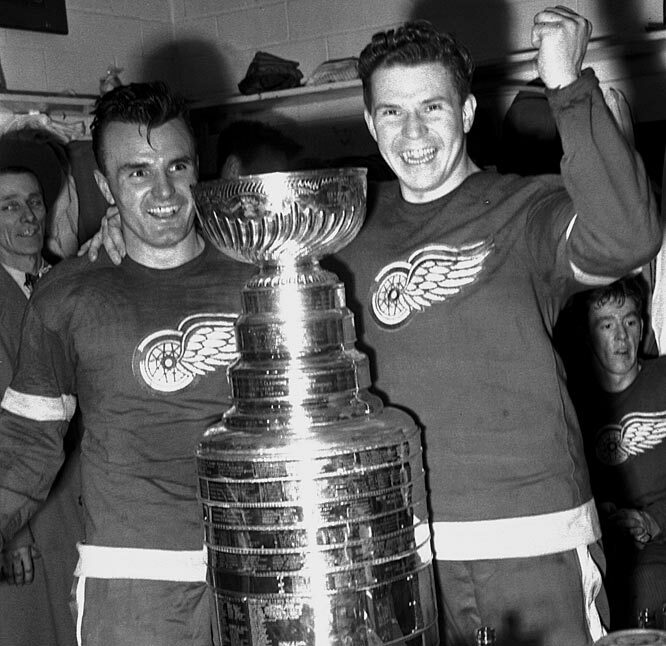 The Red Wings were without Gordie Howe, who was sidelined by a fractured cheekbone and nose, but hard-working left winger Pete Babando (left, with Harry Lumley) stepped up to play the hero in front of the home crowd. 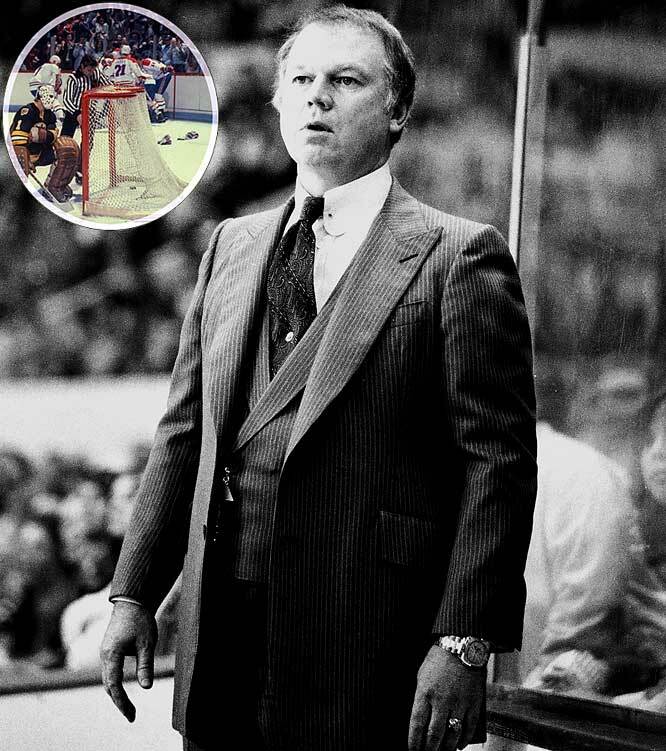 He beat Rangers goalie Chuck Rayner after 28 minutes and 31 seconds of extra play to settle the first Stanley Cup Final decided by a Game 7 overtime. • A bunch of kids were excited to meet Sidney Crosby as he arrived in Vienna to join Team Canada for the World Championship. They were his teammates. • Funny things can happen at the World Championship. Here's a video reminder of five great underdog stories from previous events. • This is what an off-night looks like for Connor McDavid. • Brendan Shanahan is taking his time with his search for a new coach and GM for the Maple Leafs because the field of candidates is only getting larger.